Copyright law is intended to help foster creativity & protect creators. But for educators in the digital age there are a lot of grey areas. Here's a guide to help you learn more. Image from University of Minnesota Libraries. “Fair use is any copying of copyrighted material done for a limited and “transformative” purpose, such as to comment upon, criticize, or parody a copyrighted work. Determining "Fair Use" isn't always simple or easy and All FOUR FACTORS need to be considered. 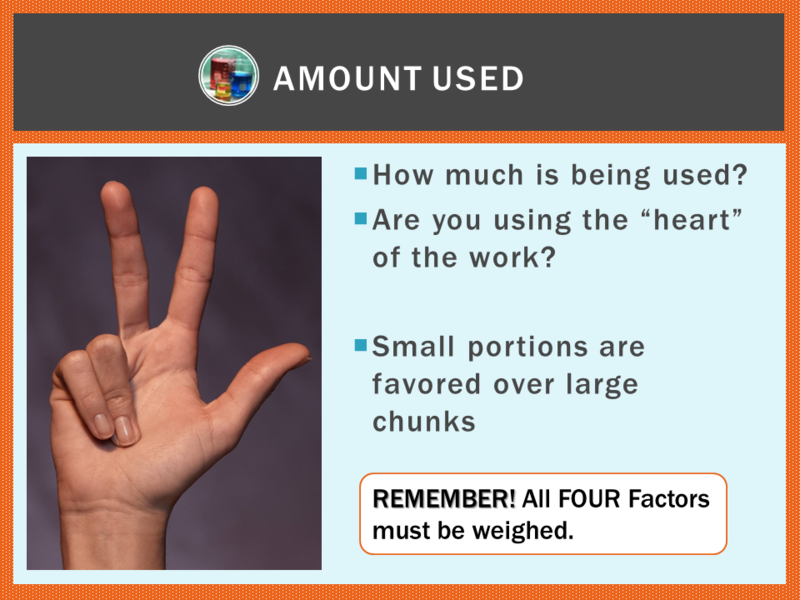 This Online Fair Use Evaluation tool, from the American Library Association provides step by step tools to help. Q: What is Copyright anyway? A: Copyright is a form of limited-time protection for creators (writers, photographers, artists, film producers, composers, programmers, etc.) to have exclusive rights over who can reproduce, prepare derivative works, distribute copies, and publicly perform and display their published and/or unpublished works. The U.S. Copyright Act gets its authority from Article 1, Section 8, cl. 8 of the U.S. Constitution. Some things are not protected by copyright (ideas, logos, facts, works in the public domain or published by the government, for example). And portions copyrighted items can be used for commentary and criticism under the "Fair Use Rule." Q: I used to copy articles for a class of students, can I send a digital version of the document instead? A: Posting copyrighted materials online, without getting proper permissions, may violate the rights of the copyright owner(s), even when used for educational reasons. Unfortunately, copyright has a lot of grey areas. 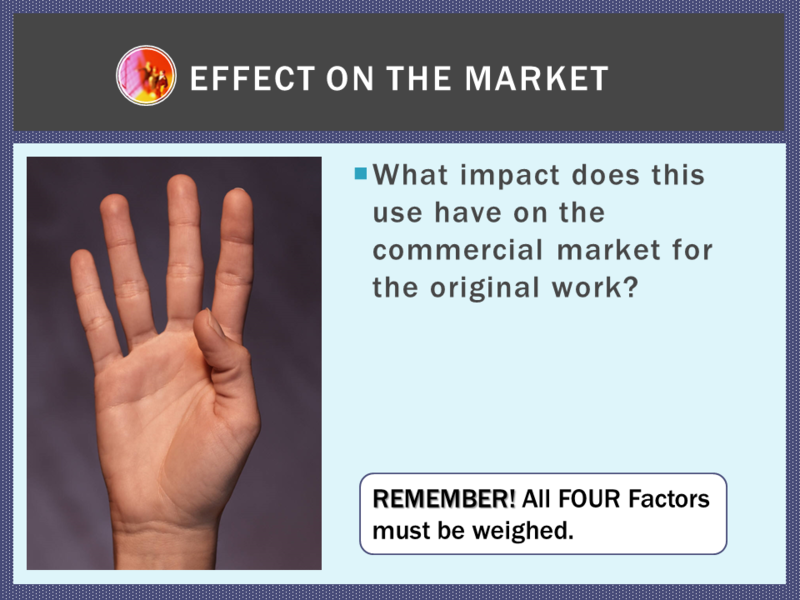 But if you are digitizing content, you are transforming the work, AND if your purpose is, in part, to save your students money, that does have an effect on the market. This may not be fair use. Linking directly to a legal online version of the article in question is more likely to be acceptable. Since the library already has license agreements with database vendors, sending students links to those resources, usually falls within copyright law. Subscription databases often offer persistent URLs (or Permalinks) to help users return to important finds. Q: Can I reuse materials I find on the Web? A: Any material created, whether it has a copyright symbol or not, is property of the originator. It may be tempting to think that if you found it easily on the internet, it is freely available to use. 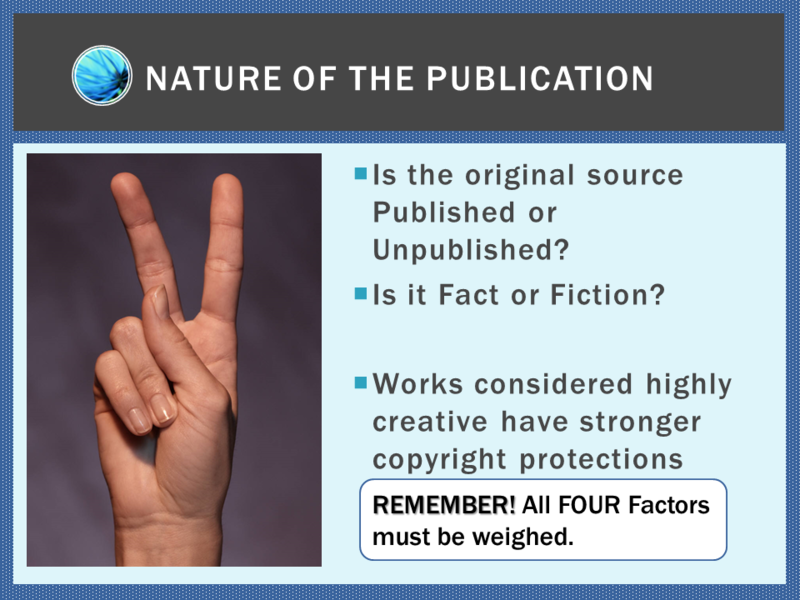 But, web resources have the same copyright protections as physical creations, so it is important to weigh factors of fair use before simply reusing online content. Digital copies often include copyright statements like the following: "Copyright of this work is the property of American Poetry Review and its content may not be copied without the copyright holder's express written permission except for the print or download capabilities of the retrieval software used for access. "This content is intended solely for the use of the individual user." If such a statement is included with your document, it's better to link to the item as each student would constitute individual use. Q: Where do I go to ask for digital permissions? A: Permissions, whether print or digital can be obtained from the owner of the copyright. This guide from IU, Bloomington gives great advice on this. The Copyright Clearance Center oversees many publishing houses and offers an Annual Copyright License as well as Pay-Per-Use Services. Q: What is Creative Commons? "Creative Commons licenses are not an alternative to copyright. They work alongside copyright and enable you to modify your copyright terms to best suit your needs." In this video, "join Jane, the campus librarian, as she provides a fun and informative overview of U.S. copyright law and its impact on colleges and universities." 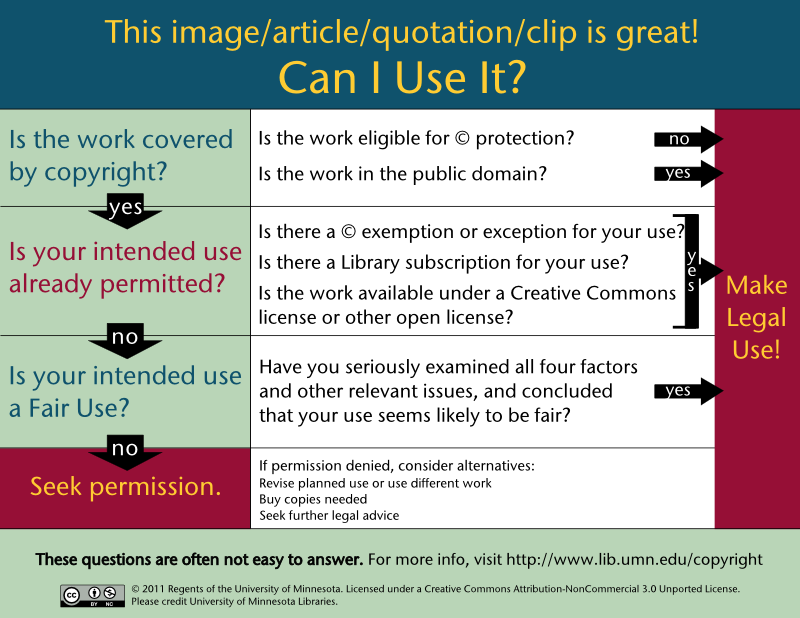 Information from the Copyright Clearance Center about various aspects of copyright in an academic setting. This Q&A from the Library of Congress offers best practices on how to use online primary sources with students. Projects and tools supported by the Creative Commons initiative. "This page includes links to teach about fair use, Creative Commons, and supplies some ideas to help students internalize this important aspect of becoming a good digital citizen." An A-Z list of the electronic resources to which Wheeler's Prescott Library subscribes. Share a segment or entire video with your class via links and embed codes. Access to current issues of magazines. Access to Digital editions of magazines including The Atlantic, Consumer Reports, Sports Illustrated and more! This subscription database service includes digital versions of classic and contemporary short stories and poems. Literary Reference Center is a full-text database that combines information from major respected reference works, books, literary journals as well as original content from EBSCO Publishing. Literary Reference Center contains full text for more than 31,000 plot summaries, synopses and work overviews, nearly 100,000 articles/essays of literary criticism, more than 159,000 author biographies (including more than 22,000 in-depth bios), 450 literary journals, more than 632,000 book reviews, more than 69,000 classic and contemporary poems, more than 18,000 classic and contemporary short stories, more than 5,600 author interviews, more than 8,200 classic texts and much more.